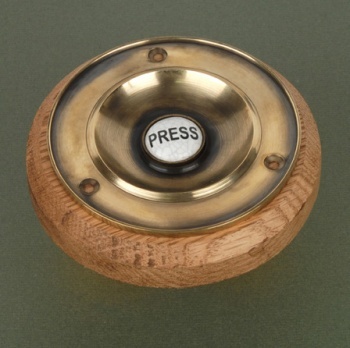 The Foley Bell Press in brass is an exciting new addition to our period door furniture collection. This circular, Edwardian styled bell press is suitable for use with all modern day, battery powered chimes. Cast in solid brass, it incorporates a beautifully detailed ‘crackled’ aged effect, ceramic press. It is mounted onto a solid oak backplate and comes complete with fixings and full fitting instructions.